Better by Marand is a Diamond Sponsor of 22nd HISI Annual Conference & Scientific Symposium, which is taking place on 15th and 16th of November in Dublin, Ireland. The event is dedicated to all stakeholders passionate about the digital transformation of healthcare. This year’s theme of the conference is “Discover: Inspire: Protect”. Healthcare Informatics Society of Ireland, the event’s organiser, is hosting many established international speakers, including Better CEO Tomaž Gornik who will give his presentation at the Industry Session on Thursday morning (16th of November at 10.00, venue Davin Suite). 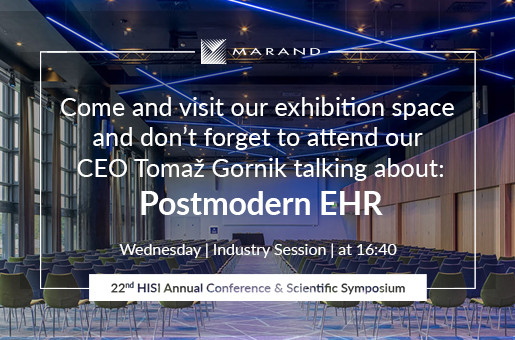 In his presentation, Mr Gornik will focus on Postmodern Electronic Health Records (EHR) and recent cases, which indicate that openEHR based solutions have matured and can meet the highest levels of requirements of EMR Adoption Model. For instance, Ljubljana Children’s Hospital in Slovenia recently became the first hospital in the world using a clinical system based on an open platform to be awarded the EMRAM level 6. Plymouth Hospitals is the first NHS Trust to implement a comprehensive closed-loop medication management system OPENeP, an ePMA solution based on an open platform. Mr Gornik will also highlight other use cases including customers like Salford Royal NHS Foundation Trust, Eurotransplant, Genomics England, City of Moscow and others. Postmodern practices in EHR are focused on ensuring universal interoperability among all forms of electronic health data, including EHR. Open standard solutions enable a multivendor environment built on open and agile architecture, where introducing, renewing and replacing applications, devices and cloud services is easier and faster compared to legacy monolithic EHRs. Open standard solutions enable healthcare systems to build electronic health records compliant with Gartner’s recommendation, stating: “truly effective and sustainable open architectures will need a capacity for vendor-neutral data persistence, such as utilizing a common scheme or set of archetypes and rules for managing structured and unstructured data”. Our vision for healthcare IT is coined as "Integrate. Open. Innovate." Better Platform™ is well aligned with this vision as it uses IHE-based standards to integrate existing devices, systems and data. By storing data in an open, vendor-neutral format, it enables ecosystems of vendors to innovate. This approach is fuelling next-generation solutions known as the Postmodern EHR.